Dear Chakku, what a handsome boy you are. Your snowy white coat looks so soft, and your face with that pink nose and those mesmerizing eyes is so sweet. You're doing an excellent job keeping your coat in an outstanding condition. You have never met a stranger, and you are a favorite in your house as well as in the neighborhood. You are also very playful, and everything becomes a toy, from belts to ping pong balls. Your taste in food is somewhat unusual, not many cats have a sweet tooth, but you balance your diet with birds. Chakku, you are an amazing and special boy, and I wish you and your family a great day full of celebration, and many more happy and healthy years together. What a good looking cat your are enjoying all that love from your family and all the pigeons you want. Dearest Chakku, you are gorgeous! What a beautiful white kitty you are, with that fur that looks so soft and the sweet face with that cute pink nose and the lovely big ears and big eyes. Thank you for sharing all those great photos with us! They all show off your beauty so well. I wish I could reach through the screen and all the way around the world to Pune, India to pet you! I can't, of course, but I know your loving and beloved humans will pet you for me . And what a delightful personality you have! You are very loving and friendly, and you're a favorite all around your neighborhood. You make your dear family members smile with all your energy and antics. You love eating sweet dishes, keeping yourself very clean, and sleeping comfortably on the bed resting your head on a pillow. You also love playing with small toy cars, ping pong balls, and belts. You're very social and don't like to be alone. If your people aren't nearby, you purr until you see them. You like to watch TV with them and to lie on your skin-sister's books when she is studying. You show your love by licking their faces and hands. You and they all love each other dearly, don't you. What a wonderful love-filled home you share! 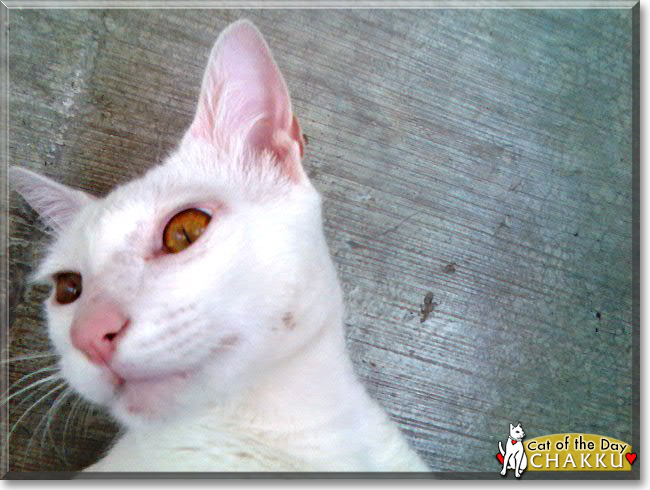 Congratulations, darling Chakku, on being chosen today's Cat of the Day! We hope you and all your family and friends are enjoying a fine celebration, full of fun and lovies and all your favorite games and treats. Last edited by phesina; 04-15-2018 at 07:32 PM. Greetings, Chakku in India! Happy Cat of the Day! What a beautiful, snow white Indian boy you are! Your sleek coat, those sparkling amber colored eyes are gorgeous! And by all accounts, you're even more beautiful in personality and heart than in looks! No wonder all in the neighborhood fall prey to your many charms! How lucky your humans are, having a furkid, a full fledged furry family member as intelligent, as sweet and loving, as special as you, Chakku! You're every family's dream kitty, beautiful inside and out, a treasure! Great thanks to your family for sharing your heartwarming backstory and BEAUTIFUL photos with us, Chakku! Meeting you this evening, having the chance to honor you, has made my evening! I hope you're enjoying a very special day of celebration...sticking like glue to your humans; playing with belts, car toys and ping pong ball, lol; receiving endless back and neck skritches; chowing down on porridge and sweets; being loved and pampered to pieces, treated to all your heart desires and more! Tons of love, cuddles and kisses to you, precious Chakku, our very special and most deserving Cat of the Day, EVERY day! Chakku, you are clearly well-loved. Congrats on being Cat of the Day! Former kitties now in foster care: Nellie aka Eleanor van Fluffytail (at a Cat Cafe), Lady Jane Grey, Bob the Bobtail, and Callie. Kimi has been adopted into another family that understands Siamese. HRH Oliver Woodrow von Katz is in a Sanctuary. I'm Homeless, but with resources, and learning to live again. Congratulations on being Cat of the Day, handsome Chakku! Hello, Chakku in India! Happy Cat of the Day! What a handsome fellow you are with your white fur and your gem-like eyes! I smiled when I read about how you "help" your sister with homework by placing yourself on her book! You play with a ball or toy cars You purr to let your people know what you need, and you are a loved kitty! Happy Cat of the Day to Chakku!